Replies: 58 (Who? ), Viewed: 61731 times. #1 10th Apr 2011 at 8:33 AM Last edited by simsample : 2nd Jul 2012 at 1:44 AM. This is a really small tutorial on routing. First I would like to apologize if I use wrong words about some stuff, my CAW is in Finnish and I have to translate the words. 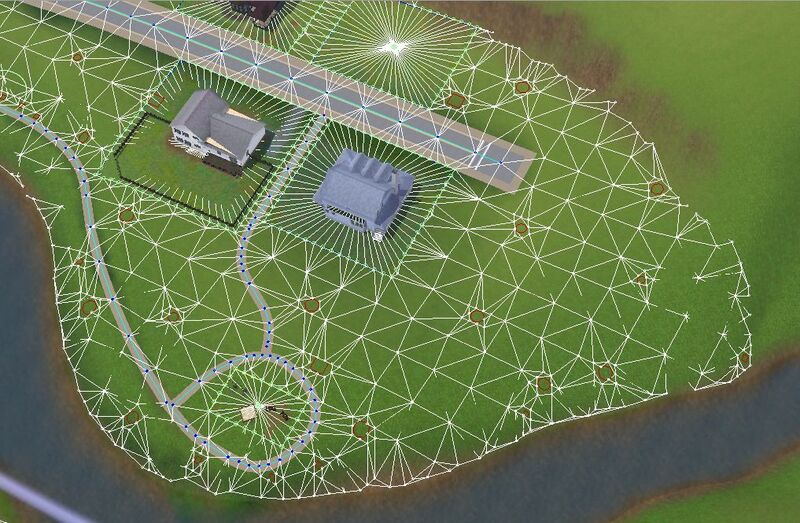 In Sims 3 worlds, it's really important to have your routing done properly, so that the world doesn't lag when you play it. Other things can cause lag in a world too of course, but routing is one major one, and can cause serious trouble if not taken care of. Moderator note: Broken routing lines have since been found to be harmless, and purely graphical- please see this information. A this point I have done nothing on the routing. 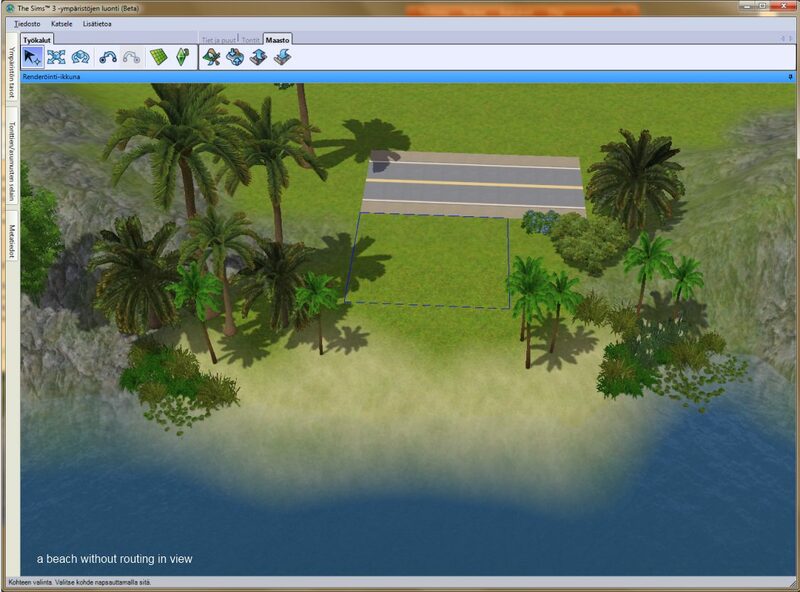 I just made a beach, slammed a piece of road and a lot there, plus a bunch of plants. Now I have marked the problem spots with red. As you can see, some of the lines do not connect to each other properly, but are cut. That causes routing issues and lag. Now you may wonder " but it's just a tiny area, how can that effect anything?". Imagine that you have hundreds if not thousands of cut lines like that in a world. One dot that has no lines connected to it can already make a world lag massively. Cause the game makes NPC's spawn everywhere in the world that is not marked non-routable. 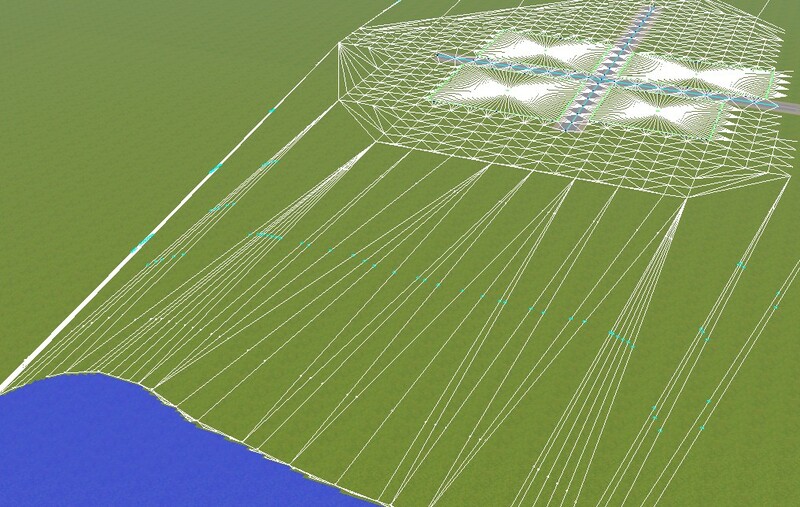 So imagine a sim spawning on top of a dot that has no lines connected. 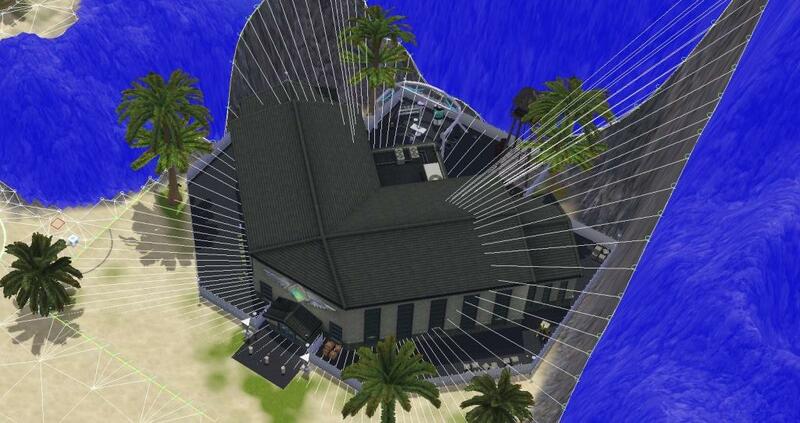 The sim has nowhere to go and is therefore stuck. Causes LAG. So to start fix this problem I first pressed rebuild routing data to see the problem spots in real time, as they are right now. And I remarked them. Then I press rebuild routing data, and voila, cliff areas fixed. I still have unconnected lines on the beach, so I take smoother brush, and smooth the areas that are problematic. Then press rebuild routing data. I was lucky to have them fixed at once. I have one more thing to show you. You should press it every time before you export a world. No matter if you have made changes or not. Broken white lines/stand alone white dots cause lag. 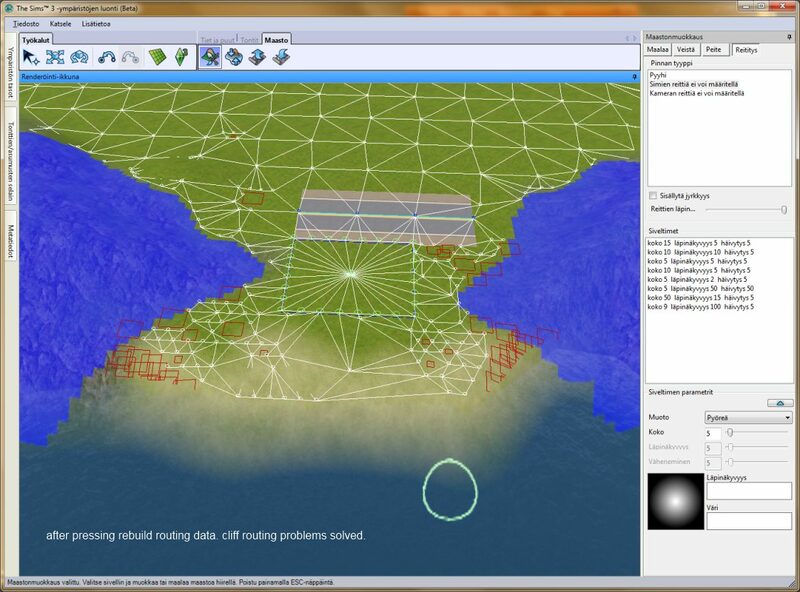 The blue paint is sims non-routable paint. You should use it everywhere you don't want sims to go. A hint: You need to move the camera a little for the routing data to update after pressing rebuild routing data. 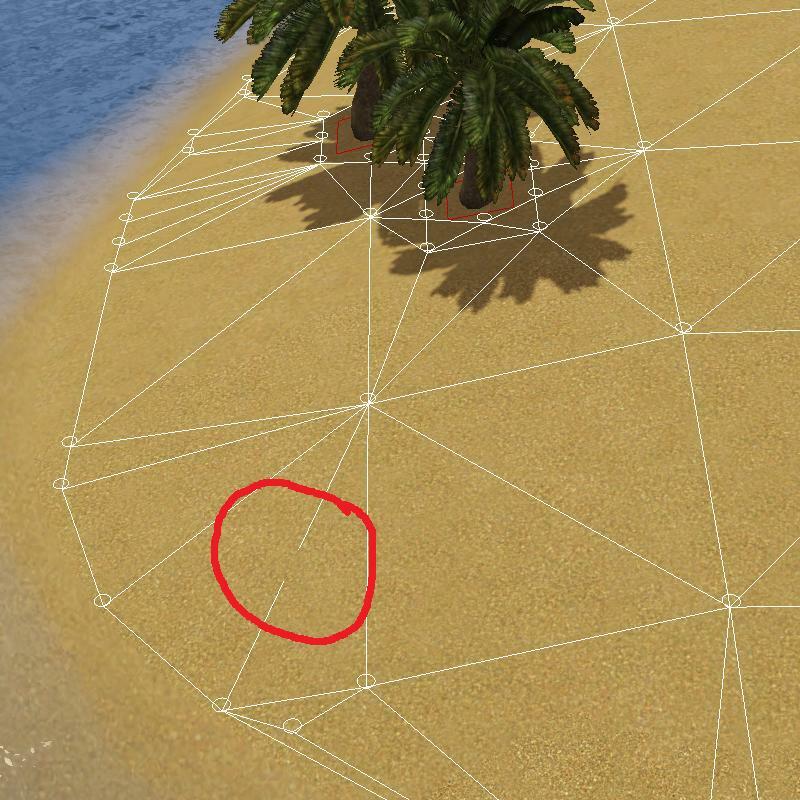 Another hint: You can place flowers or any other object to a spot that is tricky and does not fix the routing properly (sometimes there are stubborn lines), if that is convenient for that spot. Then press rebuild routing data, and hopefully the spot is then fixed. This is good information. It should be useful for those who might have routing problems in their world. Wow, this is really helpful and insightful. On a side note, I've made two worlds now, that I've never rebuilt the routing data for. I've played them for months each and never had any lag. I guess I was just very lucky, though the worlds were rather flat-ish and lacked miscellaneous objects [aside from trees and plants] placed in CAW. Well, that's not completely true. I did rebuild the routing data once for Fincastle, but I was never able to get it to save successfully afterward. [I had to go back to a previous save.] But since then, I've changed the LAA, so maybe I won't have problems saving now. The only question I still have is, when I am fixing routing, I get all the lines connected, rebuild data, everything looks good (as evidenced in picture 1) so I move on. As soon as I move the camera, the same spot now looks like it is bad routing again (picture 2). When is it REALLY good? Ah, I forgot to mention that you need to move the camera a little for the routing data to update after pressing "rebuild routing data". Editing that in right now. Thanks for pointing out. This means that one fix attempt was not enough for that spot heaven. Excellent tutorial, Armi, thanks for this! heaven_sent_8_18, I'm thinking the effect in your images is purely graphical, die to the curved ground. If the routes were really broken then there would be visible nodes. 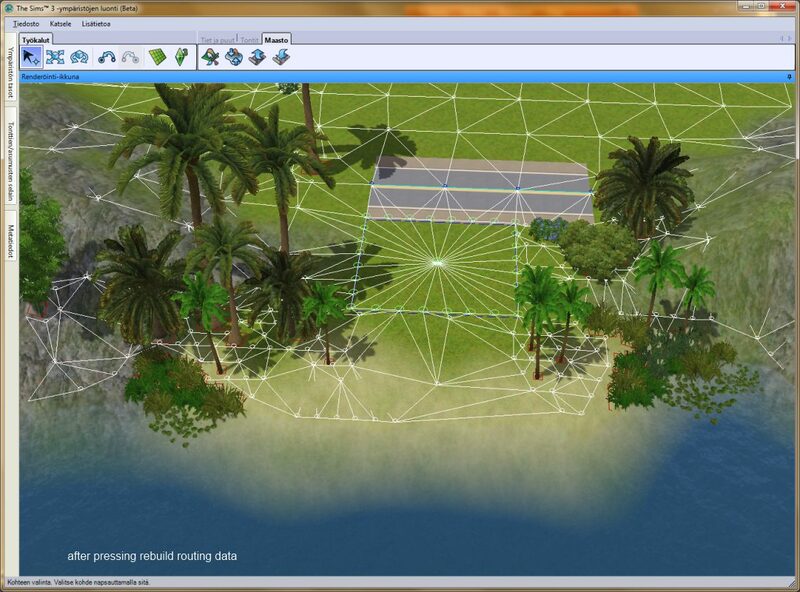 Areas similar to that in my world route correctly, the sims can run over the area and calculate the routes just fine. This thread is a lifesaver! Thank you so much, never could have fixed my lag (or even knew what was wrong with the routing) without it! Thanks, Armi! That was quite clear and concise. The sea of blue marking non-routable terrain should be smooth and not have random white dots/lines in the middle of it, which signals a break in the terrain painting, yes? So, as long as there is a white dot or a spider-web of white lines in a sea of blue is bad, right? Pic #190 is of China. Thank you for the pictures Jasumi and Ella. 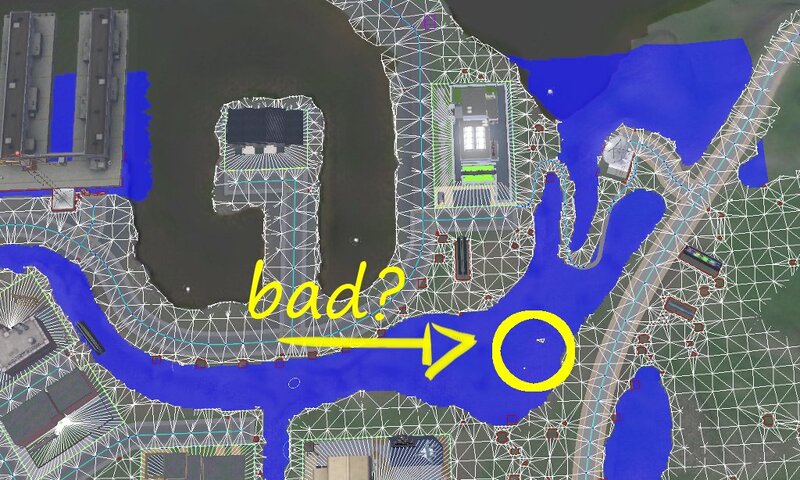 Those kinda spots are exactly what can cause lag in game, if an NPC spawns there and then can't move anywhere. As we know, the world routing is saved within the world file and can be accessed very quickly. 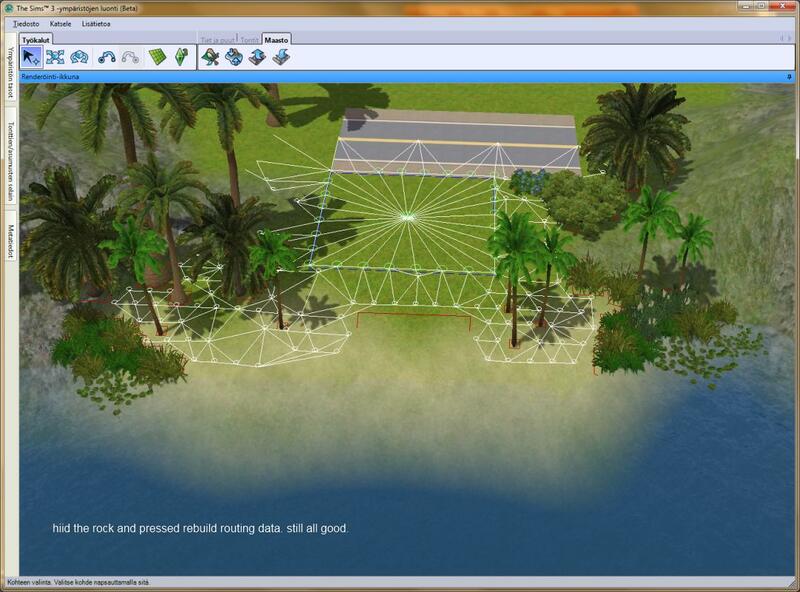 But the routing on the lots is calculated on the go (if you place a chair, a sim will still walk around it). So, to get from the lot at the top of the image to the lot to the right of the image, the game has to access the world routing file and then calculate all possible paths through the lot at the bottom of the picture. 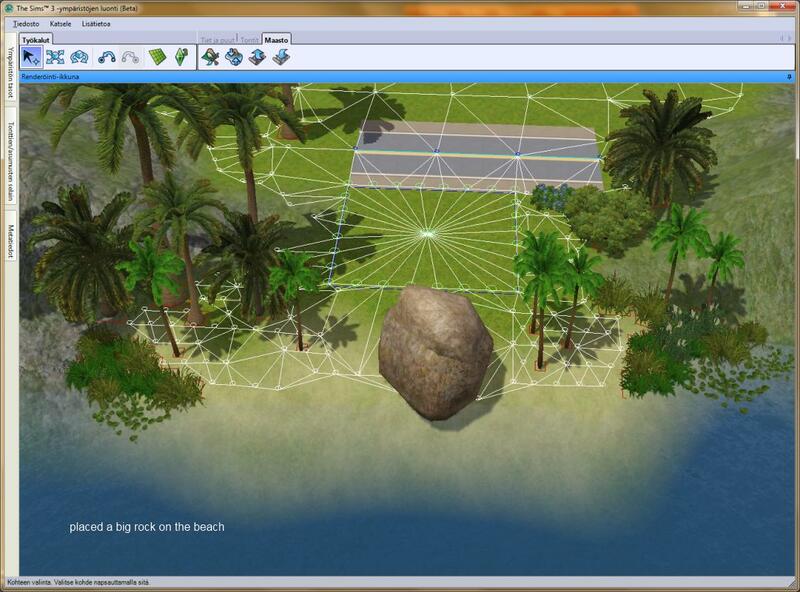 This will cause lag, and could hang the game, especially if you have a lot of sims trying to do this at once. 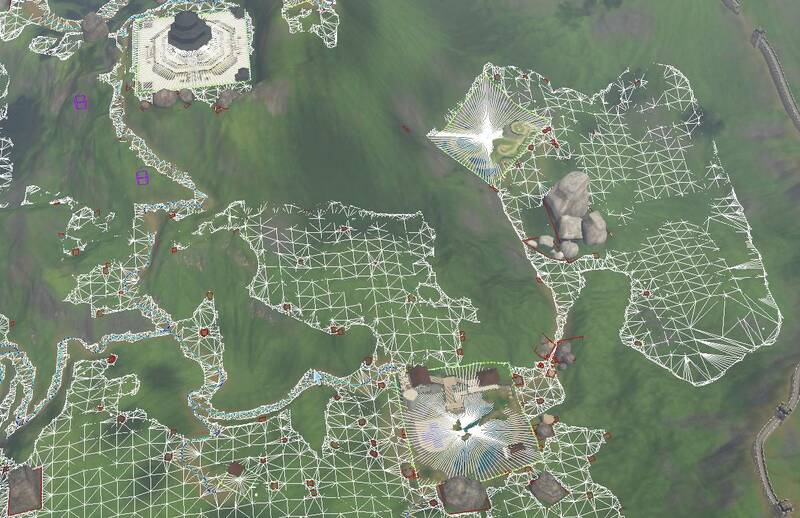 So when designing your world, it is best if your sims can access each lot from anywhere in the world, without having to first enter another lot. Any lots that you really want to be inacessible, or only accessible by visiting another lot first, can be zoned as 'Hidden Tombs' or 'No Visitors Allowed' in CAW, and then sims will not autonomously attempt to visit them. Thanks a lot Armiel. This is absolutely fundamental tutorial! In addition to Heaven_sent_8_18 and Simsample posts (see posts #4 and #6), I would also agree that it's rather a matter of graphic rendering more than a routing issue. Maybe the animation of a Sim walking on such a "broken line" will bit weird, with feet sunken in ground, but I don't think the game will have any trouble to find a proper path along this line. I did a small test. In the first picture below, there is a broken line in the routing (red zone). Yet, if I hide the terrain (in View > Layer, see second picture), the routing network looks good, with straight lines connecting to the nodes. 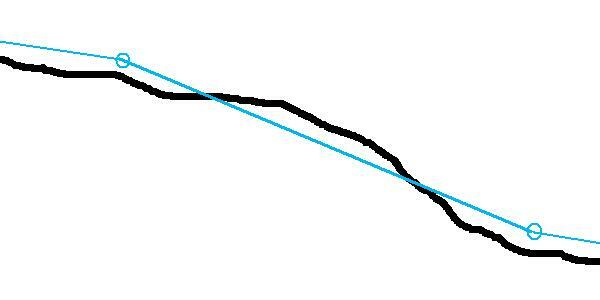 In my little sketch (I know, it's ugly, what I tried to do is a section in the ground ), the black line is the ground, and the blue straight line is the routing. 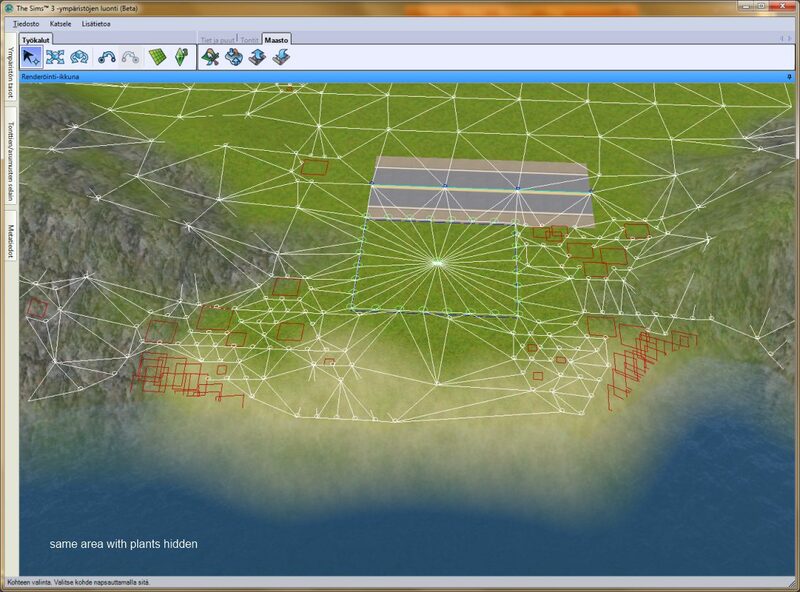 I think this is what happens in the first picture, the routing line is hidden under the rendered terrain. This message has been deleted by Andy22li. Armiel, thank you very much. This is very helpful. I just wanted to chime in and say thanks. This tutorial was very clear and direct and brought to light some important concepts that I wasn't very aware of. Hi everyone, I'm finishing my big world and encountering some strange problems with routing. After placing some large(very large and detailed lots), occasionally CAW crash while saving in EiG. Now I know that is expected, but I think I made a mistake by continuing to work with that saved file routing was fine untill I decided to lined the edges of unroutable areas, (by the grid), now I keep finding all kind of crazy nets all over the world, lots not routable with roads without any reason, and all of the sudden I keep finding unconected dots under the objects, or in completely free area. There are also strange light blue circles everywhere, on roads, lots or open areas, sometimes conected, and sometimes not. I'll return to previus save that have normal routing grid without all these things, but I'm curius as what they might be, and maybe that is the reason why some worlds are harder to play. My guess is it happen due the crash while saving since I didn't use any CC, and rebuilding routing network don't change it back to normal grid. (I can repaint some off the dots, add a tree or something, rebuild the routing and new problems will appear somewhere else). I tracked down last backup file that have normal routing network, add a little Non-Sim-Routable paint and saved under different name, and this mess appeared again. 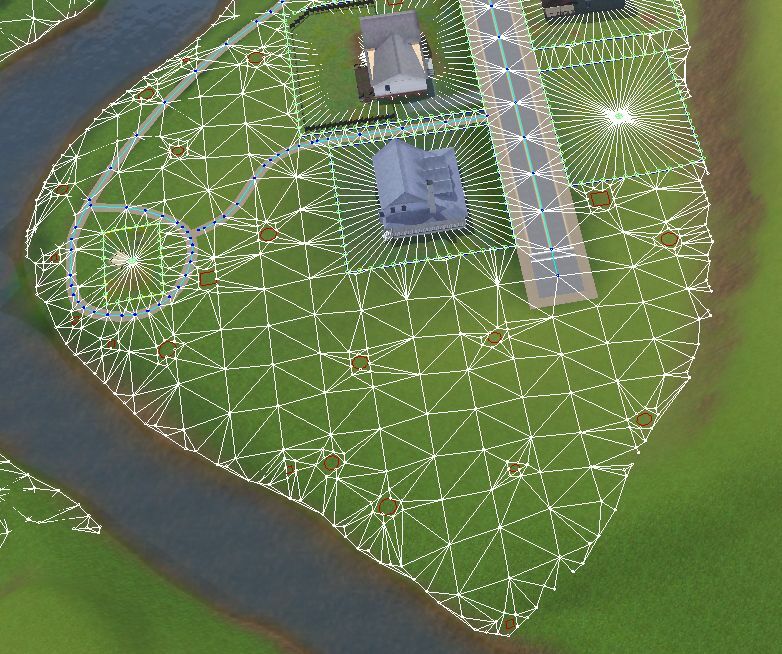 I can edit world withot problems reappearing ( I can add/remove lots, trees, objects and effects, minor sculpting changes, painting, add lots in EiG) but if I change Sim Routable areas, routing became messed up like this. I'm happy that I don't really need to use that anymore since there are no routing issues in the world, but I'd still like to change few things, which I can't now (some areas are not problematic but I don't want them to be routable). If anyone have any idea or information about this I'd appretiate it. I am sorry, I have this thread in my subscriptions, so it SHOULD pop up bold when new posts are added, but for some reason it had not done it for the earlier post of yours. I have never experienced this myself, except on early states of the world when i have only done some sculpting. But never on areas i have already worked on. 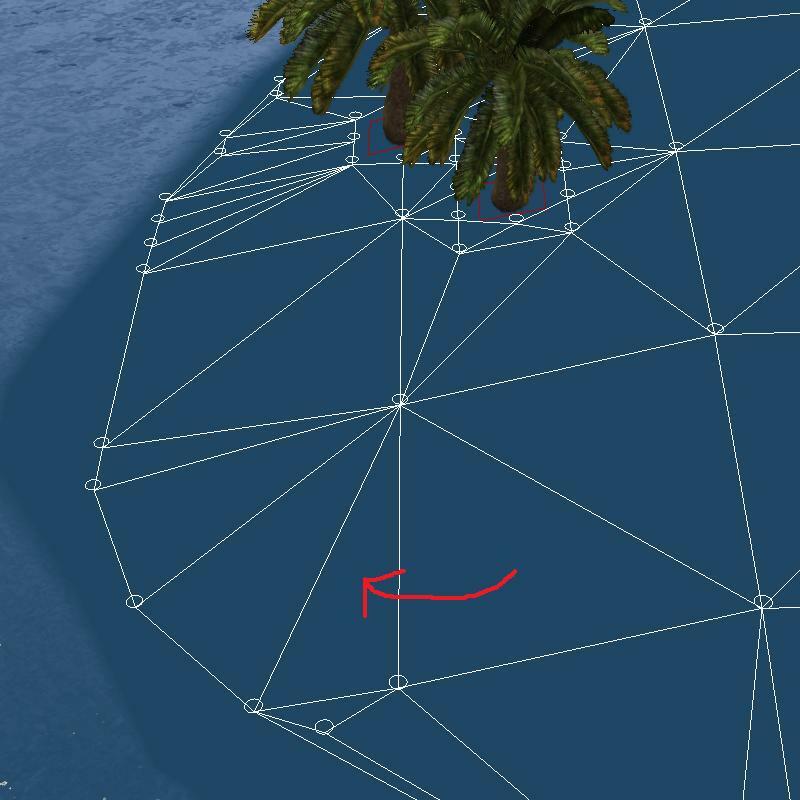 We had a user with same issue on the chat some time ago, and in their case the weird long lines went away by placing objects and lots in the way of the long unwanted lines. Maybe someone wiser can actually explain WHY the lines appear (the very long ones with bright blue/turquoise dots). Thank you for responding Armiel! If it was one smaller area, or a couple of lines I would try the solution, but it is messed up everywhere. I realized there is a problem when I tried solving one area by replacing lots (delete, rebuild routing, put lot, rebuild routing), but small turquise dots remained the same, and more problems seem to appear in other areas. I was thinking what could cause it beside bad save because it happen again while only in CAW and even without saving. 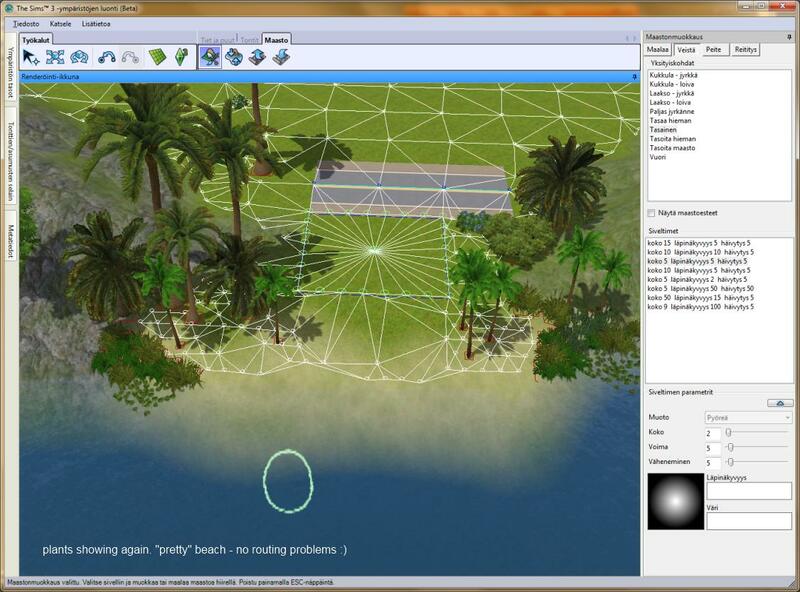 I made shore no lot, street or object is marked as unroutable, everything is connected etc and I didn't use any CC, not even a pattern, not even a freebuy from the store. I do have few mods I put lately (Porter, Debugging, Master and Story Progression) - first 3 to inhabit the world which I haven't done jet with this version, and Story Progression to track down if Sims are getting stuck anywhere in this world in game (they don't which is why I won't touch routing anymore!). I doubt it is any of them creating a problem. I am posting this to try to find the answer for future worlds I had in mind.. And thank you very much for this tread, it was very very helpful when I started to learn about routing. I don't think the long lines are anything to worry about; they always seem to occur when there are no objects on an area of terrain. I must admit I didn't realise that they ignored lots and roads though- you can see that they cross lots and roads in your screenshot- but then I seldom have an area with lots or roads that doesn't have street signs or trees or something too. This is an image from my world in an area that has very few objects- the line by my cursor arrow stretches over several segments. In my first picture, if I make a sim run across that terrain, they tend to follow roughly where that long line is, which makes me think it's a line of best route- the best way for a sim to take if traversing that area. 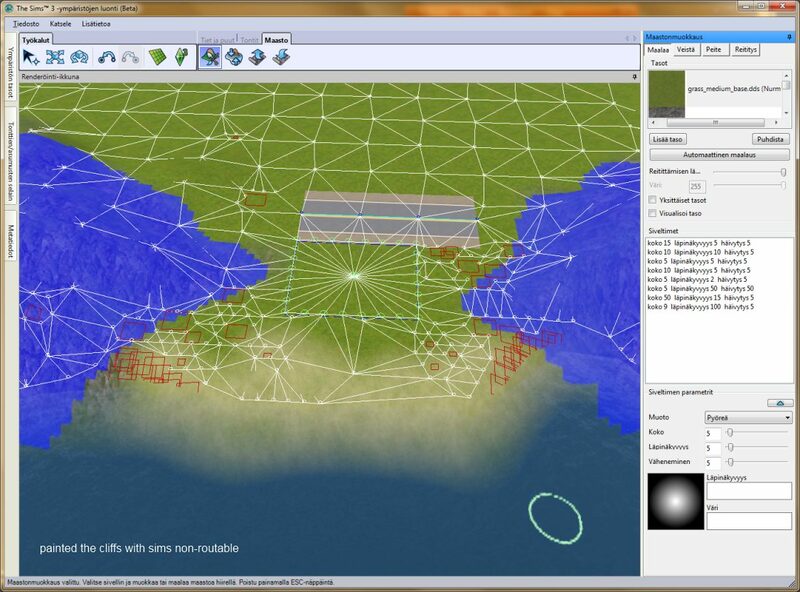 The sim can completely route to any area of that terrain, even the bits where there are no routing lines visible- in effect, the game has made a lower resolution routing network, which saves on resources. So you don't need to deliberately add objects just to make the routing look different! For your picture though, I'd like to see a render of it so that we can see the terrain and objects, as I'm puzzled why there are blue route nodes beneath a lot. In the second picture you have a lot next to a road, and the sidewalk routes are not there- indicating perhaps that you have a lot overlapping the road? Seeing a render would help us to see this. (Please let me know if this isn't what you were asking for and let me know how to get it right, I use this to check if something is hidden underground). I returned to backup and kept working on this normal version as I got pretty scared with all this mess! I can't seem to reproduce what you're getting in your world. 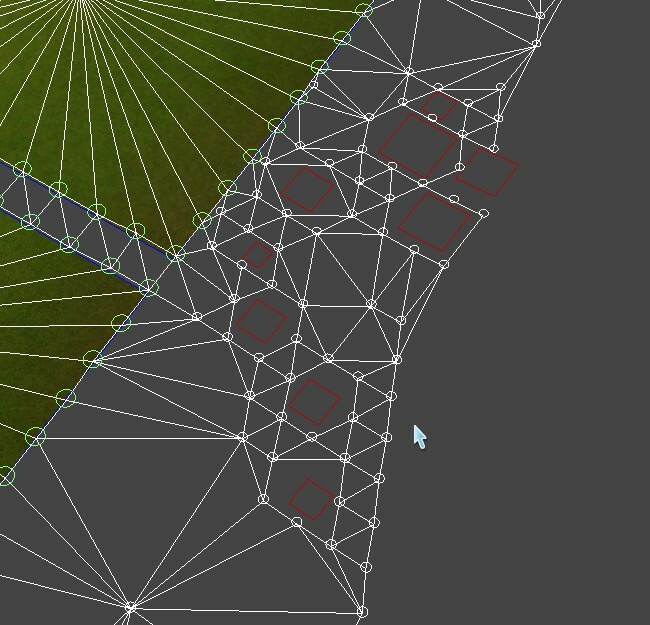 If I try to make the long splines traverse a road or lot, they won't- I get a regular mesh around lots, roads and any objects, and am only seeing the long splines and turquoise nodes when I have a large empty area. 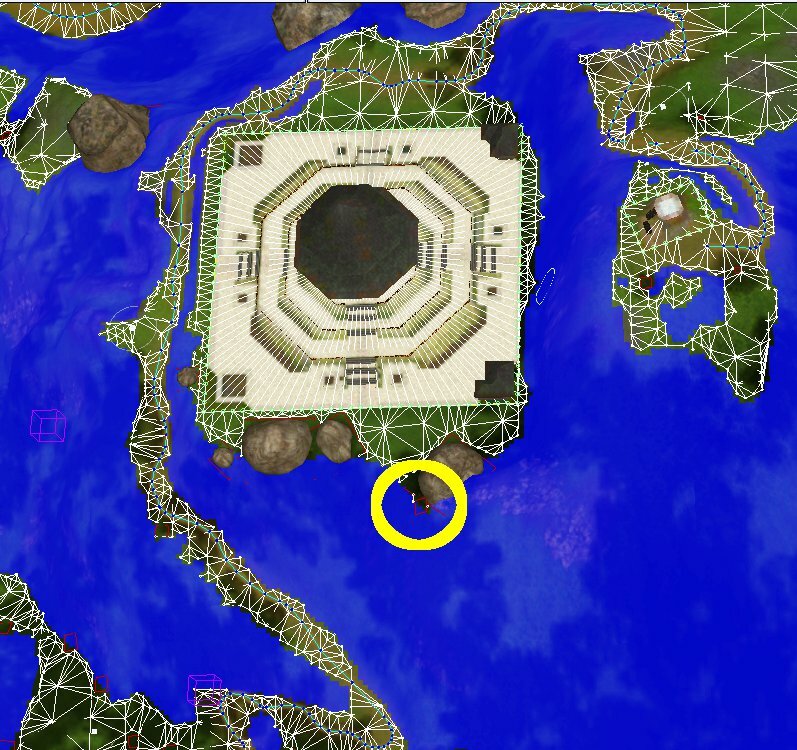 There must be something else going on in your world, could you show some zoomed out screenshots so that we can see a larger area, and see where the non-routable bits are, like in my picture? 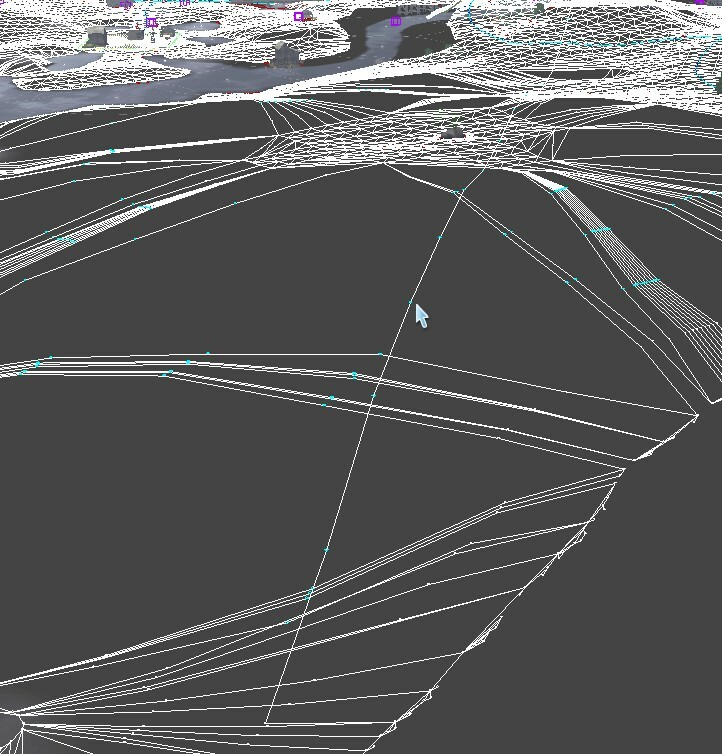 I can see from your wireframe and your rendered image that there are no objects buried there, so this is puzzling. ^ I'm getting the same thing as you are, and I don't know if I've done something wrong or not. Is it normal, or will it screw up the routing in my world? dancingwattletree, could you post a picture too? I'm sorry for not answering earlier. Eventually, I went all the way back to the world version without lots and objects, marked routing areas along the grid and it was all fine, then I copied objects and layers folders from latest version to that world, did some severe checking if something is floating or underground, and only then placed lots and buids on those lots. These lines never appeared again, but it was a lot of tedious work. Hey Anushka, glad you got it fixed! The best place to post a link is in the Free Updates forum, where everyone will be able to see it. I will check your world out, it looks great! I was wondering if one of the next pictures causes lag ?